Replacing Eating Confusion With Eating Clarity! A reminder to us of why we eat, to bring clarity after years/centuries of confusion. We in Human form are the kings/queens/managers and caretakers of all our cells, thoughts, emotions, abilities, and energy. We have a body for the duration of our life here on Earth until it tires out and must cease activity. We must take care of it, water it, provide it with nutrients our cells require for functioning, so that it can get us about. As humans we are creativity, and there is no better example of how confused we can become from our own creativity, than that of our confusion with eating. Then there is all the confusing information about ‘dieting’ itself, and how to lose the extra physical substance we add onto ourselves when we ‘mess up’ our eating. So many of us are unhealthy because of what we are putting into our mouths, as food. But first of all, relax! There is historical explanation for this widespread confused state that Humanity is experiencing, and how health got left behind. To make that which is nutritious for us, palatable and digestible. That is what we are meant to be doing and have all the ability to do. Making foods that provide us with our energy requirements, tasty to eat, rather than eating something just because it is tasty!! Much confusion has arisen simply from historic emphasis on economic growth over health. As people travelled to explore and seek new lands, trade resulted in new foods, new dishes, new potential markets for money-making ideas. The concepts “breakfast, luncheon, dinner” are just words that were not around when we first had meals. They were made popular with economic growth – the difference between ‘the haves’ and ‘the have-nots’ – a fancy word given to describe a meal you knew you were going to have. Other words “tea, supper, brunch”, all words to describe a meal. Massive popular advertising ensued. To have these things, to be able to eat these foods ‘made you better’, ‘made your life better’ , and the use of ‘governing by etiquette’ had it that you wanted these things for when you invited people over, so you were ‘seen to be’ doing well/better. It was an enormous all-consuming continual advertising campaign, as the media grew, and as inventions enabled it more and more coverage for greater distribution and influence. These days we can look back with the insight that, when there is less choice, and when there is less bombardment of stimuli, we know that life is actually easier. We have now experienced the disadvantages of many of these new food products, and many of us are going against the popular tide, returning to the healthy reliability of natural foods, Interestingly the popular tide itself is now turning, and ‘healthy natural organic places are also the favourite places of the elite and those who can afford more. It has become so that those without any income at all, and those in the top income tier are eating natural foods! What does this tell us about food and use of food for economic promotion? It says “Been there, done that, and now we know better”!! All of this extra confusing information aside, remember that we are fully capable of nurturing our bodies – you are fully capable of it. The size of our brain potential, our creativity ability, and our hand structure, all make it so that we can all do this. As we are creativity, and competition has led us to focus this with food and selling of food, much that is available for purchase I do not consider to be food anymore. What once began as a food, I now consider has been turned into an artwork. What we see, smell, taste and even hear as we bite into it, is all valid and lovely for us to experience. Is it a taste sensation artwork? Full of sugar for an instant, overwhelming experience or high A visual artwork? To marvel at the colours and construction. Or is it a textural experience, with a warmth and an icy cold, or a crunch with something soft? 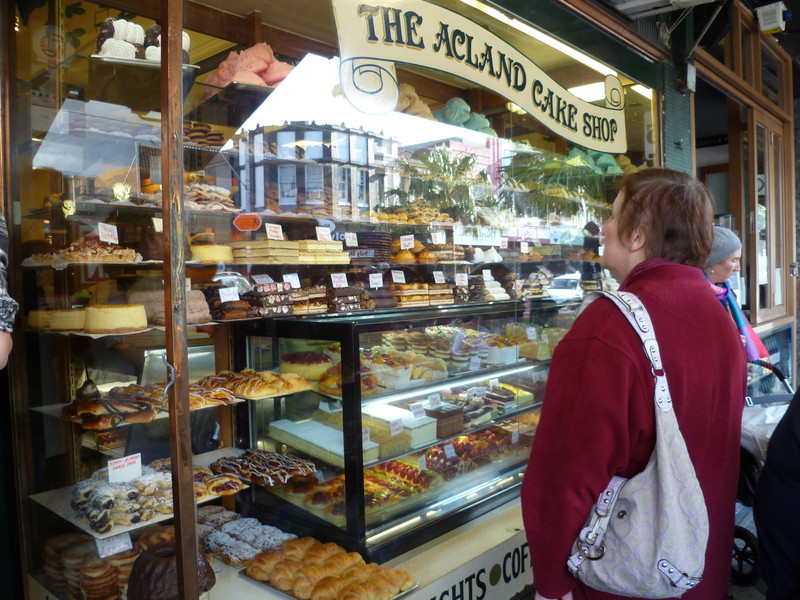 The above pic I chose to share the famous cake stores in Acland Street St Kilda, Melbourne Australia. There are many examples around the world of stores with displays of colourful creativity on display. The chocolate shops in Edinburgh, the pastry shops in France, delicatessens around the world, showing wonderfully creative inventions, expertly produced and packaged…. I get a high from seeing such craftsmanship and skill. I enjoy the colour combinations, the combination of textures and ingredients. I can really appreciate the human skill involved. I love it when people do their best to bring out an idea. I feel nurtured by experiencing this and feel energetically lifted and inspired. However, I do not want to eat it. I do not want to put it inside my body as fuel. I do really enjoy staring in the windows. I do go inside the shops to enjoy the creativity…the art, as though I am in a gallery. It is something that I do not want to clog up my intestines with at all. The most I would do is taste it, but I find I can practically taste it with my imagination as I gaze at the art, to make consuming it unnecessary. My spinach and rice creations are a far better fuel. As we want our body to be energetically maintained. We want to eat that which gives us energy, with minimal energetic loss. This also means eating what makes us feel good….not just what tastes good. Using your creativity to help you to feel good. Or do you eat to feel good? Why are you only feeling good when you eat? You are distracting yourself from the energy/feelings/thoughts that are ripe to be cleared from you. As a human being you have the ability to know that it is your responsibility to look after your body, and to be able to give your body the food it requires. You have the potential to look after all of your needs. The intent of wanting to know this, creates the place in you, to receive it. As energy beings, we have the responsibility to govern our energy and food mastery plays a bit part in this. I LOVE having a fit body. The ease it gives me as I live my life. The urge I get to run up a hill…or roll down one. To go quickly from a sitting to a lying position to a dance position. To be spontaneous, to swing from a vine if I came across one! It was not always this way for me. It was a hard wooden adult’s chair and the food just got colder and colder. I did not often like the meals prepared, that repeated over and over again with no variation. Though it was too much for me to eat, it was interpreted as “down right disobedience” if I did not “finish” my plate. A great Aunt once took pity on me. Seeing me still at the table a long time after everyone else had left, staring at the cold heap on my plate, she silently removed it. This happened one time, but it was only once she or someone else was around us at this time, or any other! I was not given opportunity to learn my food intake and individual needs when first relating to food, and it has taken time of healing and discovery. We each are different and need to learn to respect our body’s process of digestion. Approaching ourselves in an enquiring way, allowing for our body’s needs to be different from what is on telly, allowing to ‘listen’ to our body, allows a connection to develop that alters our mind-set, and makes it easy to care for our body the way we need to. I learned early on in the family home, that the only way to be able to leave the table and to get away from these people was to eat the food, then to vomit it back up, when I had got to safety upstairs. I began doing this perhaps as early as seven years old, and my own creativity had given me this solution-seeking suggestion. This was such an upside down, backwards, Alice in Wonderland, madness nonsense household, where it was more important – to the extent of being drilled in a shouting voice – how you were holding your knife and fork, than a place to give your body the food you required for health and well being. And most interestingly of all, this was all done, by an educated British woman, doing what she had been taught. I feel it is possibly the way people begin bulimia, that they think of it themselves, without needing to be given the idea. It is actually a clever solution, to bypass a bodily function, and it can be a helpful skill if you consume something harmful to ingest. It takes a certain amount of thinking ‘outside the box’ and the anorexics and bulimics I came across in various hospitals that I crossed paths with, on my own healing journeys from a range of accidents/injuries, were always the most creative, interesting and intelligent girls. My experience of my introduction to food and eating, was just another part of the battle for me to be living in this home, aiming on being the best Human Being I could be, while having to live under this ruling nonsense around me. Beginning with no understanding of it, led me to need to learn from scratch. I approach eating as providing myself with my nutritional requirements. I do not eat for any other reason. I was the manager of a food co-operative in Canberra in the late 80’s, and I learned much from this position. The enjoyment I get from being fit and healthy and being able to rely on my body, far outweighs for me, any enjoyment I get from a brief sensation when I am consuming something. To be able to manifest all that we can be, to be able to contain all that we bring down to the earth plane, does require a high level of physical health, posture, and energetic health. If in doubt don’t eat it. I discovered soon after the many benefits of a vegetarian diet. Many people are being conscious of environmental consequences and eating free range organic produce, including meat. It is energetically responsible for us, not to cause ourselves energetic discomfort from what we eat. We want to choose what contains for us the most energy also, choosing the healthiest, most energy filled choice/specimen. We are meant to know the source of our food, and we contain within ourselves all the potential ability to know this. If you are caused to feel uncomfortable, when you learn of the source of a food, if it does not feel right or if it feels agitating, know that you are meant to find another food source.